Orleans, Massachusetts is just under an hour from the Bourne Bridge in Cape Cod and a perfect lower Cape escape. Orleans is part of what’s considered the “Lower Cape,” which also includes Brewster, Chatham, and Harwich. It’s a great base for further exploration of the Cape. That was exactly our pleasure during an off-season getaway, where my friend Jim and I experienced Orleans in a way many “summer people” don’t. Regardless of which season you visit Cape Cod–whether it’s the slower pace of the off-season or the warm beachy summer months, we know you will enjoy the chic hospitality of The Parsonage Inn. The Parsonage Inn in Orleans, Mass. On arrival, The Parsonage Inn had curb appeal with its spacious courtyard surrounded by an L-shaped property. The sprawling Cape Cod-style house with attached barn and front patio offered classic New England charm. 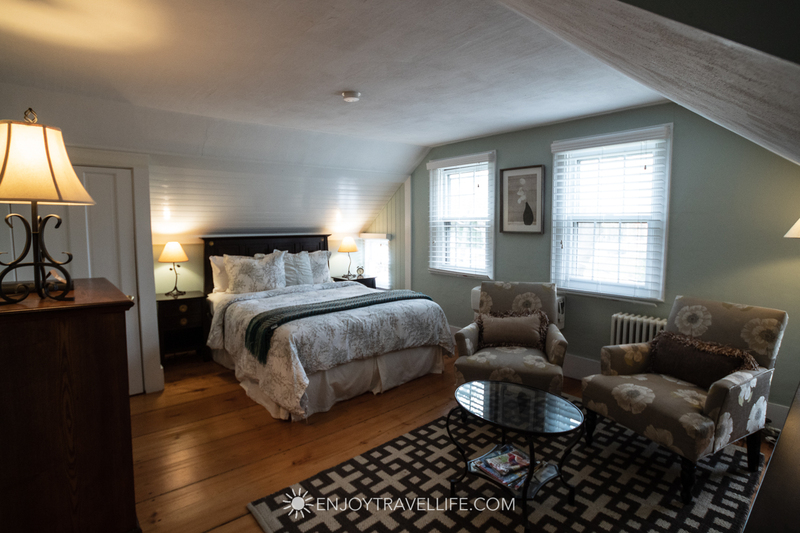 When we stepped through the front door of The Parsonage Inn, I admired the lovely decor, a blend of warm tones with a light, bright ambiance and beachy accents. It was very cozy and stylish! What a great home base for our lower Cape escape. We met Richard, the innkeeper (and would later meet Jo-Anne), who made us feel right at home and provided some history about the inn. He pointed out the 240-year-old pumpkin pine flooring which glowed underfoot. They were gorgeous wide-planks with the original wooden peg nails. Built in the late 1700s, The Parsonage Inn was named for owners who were prominent members of the local church. Imagine, the inn was built while the United States was still a British colony! It was hard to believe, given the updated comfortable surroundings and modern conveniences. Our room, “Mayberley,” was spacious, spotless, and chic. Besides the comfortable king-sized bed with luxury linens, the room had seating at one end and ample bureau and closet space for longer stays. The closet held extra blankets and a Parsonage Inn beach bag packed with beach towels. I was happy to find an iron and ironing board in the closet, too. In Mayberley, we enjoyed modern conveniences such as flat screen TV, Wi-Fi, and although we did not use it—silent, ductless air-conditioning. It was surprisingly quiet for a street-facing room, and we slept quite peacefully the two nights we stayed. The en-suite bathroom with vintage tile and beadboard held a pedestal sink and luxury upgrades: a roomy glass rain soaker shower big enough for two and Turkish cotton spa towels. Our hosts even provided eye makeup remover and a makeup towel. I loved the scent of the “fresh” brand Hesperides Grapefruit Bath and Shower Gel. I liked it even better when I learned “fresh” is a Boston-based, naturally sourced product line. In addition, The Parsonage Inn is part of the TripAdvisor and Cape Cod Chamber’s Green Program to be environmentally responsible. Just around the corner from the lounge was a fully stocked Keurig coffee machine with both bold and decaf varieties, and fresh organic creamer in the refrigerator. I will admit that I had more than my share of delicious biscotti in the cookie jar beside the coffeemaker. Pro Travel Tip: There is also a similar coffee center in a second-floor lounge. The service area anticipated our every need with a small refrigerator, wine glasses, a bottle opener, cutting board and knife, plates and cutlery, hot water and cold spring water dispenser and a selection of teas and honey. It also provided a range of menus from area restaurants that came in handy. Richard knew all the right places to go and made excellent recommendations. For day exploring, conveniences like branded hats and stainless water bottles were available for purchase. Bonus: half of the bottles’ purchase price is donated to the local outreach program. This common area also held a comfortable desk with a laptop and printer for guests. Beside the desk was a well-stocked brochure caddy of Cape Cod attractions, as well as a binder describing the building’s history, deed listings, historical documents, and hand-written notes from the 1800s. There were dozens of complimentary sentiments. Mornings, I leisurely helped myself to coffee and relaxed in the comfortable lounge area. I browsed beautiful coffee table books about The Parsonage Inn and the Cape Cod region and history. A nice selection of what I’d call “His” and “Hers” fiction and non-fiction books filled either the side of the original fireplace. And, The Boston Globe, The Cape Cod Times, and The New York Times were all magically waiting for me on the table. The dining room was casual and comfortable and dotted with works of art from an impressive collection. We opted for a later breakfast at 9:30, and chose to start with the buffet, including Jo-Anne’s signature granola and yogurt along with fresh fruit. The inn‘s breakfasts focused on seasonal variations and aimed for local, organic, or self-grown produce whenever possible. This included organic milk, nitrate free bacon, and natural ingredient sausages. Pro Travel Tip: In the warmer months, breakfast is optionally served alfresco on the patio. Before additional guests arrived for the weekend (a full house! ), we took a tour of some of the other rooms in the inn. Of the eight guest rooms, each was out of the pages of Better Homes and Gardens. The color palettes, fabric choices, furniture arrangements, and accents were made all the more interesting given the character of the historic home. Someone at The Parsonage Inn clearly has a second calling in interior design. The Parsonage Inn was an ideal place for us to call home while exploring the Orleans area on our lower Cape escape. It was spotless, comfortable, chic, and conveniently located. But my favorite thing was spending time in a place filled with interesting stories, laughter, and lightheartedness. Richard and Jo-Anne set such a warm and welcoming tone to the inn, it was easy to see why regular guests would return year after year as they do. Rock Harbor Grille: This was an over-and-above foodie experience in a casual environment. I highly recommend dining here. The Beacon Room: We stopped for an early dinner and hadn’t yet worked up an appetite, so we split some delicious appetizers at the bar. This was a more formal affair, and the full menu looked amazing. Nauset Farms was across the street from The Parsonage Inn. It offered delicious sandwiches, home-made food to go, wine and more. Main Street Wine and Gourmet had great wine and cheese selections along with craft beer and gifts. Orleans Wholefoods Store, not to be confused with the chain, carried a selection of natural and organic foods. Alice Mongeau Gallery and Studio: We saw Alice Mongeau at work in her studio along with her award-winning art collection. It was a pleasure to meet Alice. Kemp Pottery: Steven Kemp gave us a tour of his pottery workshop and explained his resist process in creating beautiful, unique works of art. He ships worldwide! Nauset Beach: on the Atlantic Ocean, perfect for catching waves and the sunrise. Skaket Beach: on Cape Cod Bay, with long flats, tidal pools, and great sunsets. South Orleans Beach: on Pleasant Bay, warmer waters and scenic views. And three freshwater beaches, one at Pilgrim Lake and two on Crystal Lake. For bicycling, the Cape Cod Rail Trail runs through Orleans, too. And if you love bird watching, get yourself to the Birdwatchers General Store. You can buy birdseed in bulk and marvel over unique gifts for bird enthusiasts. For boutique ladies fashion, check out Weekend, Salty Crown, Homegrown Trades, and If The Shoe Fits. For gifts, I suggest Adorn, Left Bank Gallery, and Blake and Co. So, there you have it–there’s plenty to see and do in Orleans. I’d love to know, what sounds most interesting to you? Special thanks to The Parsonage Inn in Orleans, Massachusetts for their outstanding hospitality. This article is part of a sponsored collaboration between The Parsonage Inn and Enjoy Travel Life. As always, all opinions expressed are my own. For more information, please see the following Disclosure. Such an exhaustive an immersive experience The Parsonage Inn is offering its guests. With an artistic decor, homey hospitality, and some yummy food on offer, who wouldn’t love to spend a few days at The Parsonage Inn. You are so right about that, Arnav! The Parsonage Inn was a great getaway and I think anyone would enjoy it! What a great review and the Parsonage Inn looks and sounds like a very wonderful and traditional New England Inn. I have been to the Cape twice, but never spent time in Orleans. Need to change that. Next time I am in Boston! Orleans is fabulous! I hope you get a chance to check it out soon, Michael! I couldn’t agree more, Lola! I’ve never been, but whenever I watch movies and the people talk about going to Cape Cod it’s almost always something fancy about it. And your blog post confirms it. I love the way the inn is furnished. And, my God, that bed is huge! It must be so comfortable to sleep in. It looks more like a home than a hotel, which is what I love the most about The Parsonage Inn. Plus it seems like it’s in a great location! That’s exactly right, Darah! It is very much like an expansive home, and definitely in a perfect location for exploring the Cape. That lounge area is so homey!! Cape Cod is certainly somewhere I want to visit eventually! I used to love to do B & Bs, and the US does them really well. The best part is the breakfast, and yours looks and sounded delicious. This place sounds like a dream!!! I’m thinking about doing a bike trip along the coast this summer and treating myself to nice accommodations sporadically throughout.. This just might make the list. I mean come on, that breakfast looks too good to pass up! 240-year-old floors!! Not something we have in my home state! I absolutely love the style and that the rooms have names! The Mayberley looks huge!! I love how light and airy the entire place looks and that breakfast had to be amazing! Yes, there is a lot of history in coastal Massachusetts for sure! We loved our room–and the fantastic breakfasts! That is such a delightful place to stay. Perfect to pretend that one has gone back in time. The decor is old-world-charming. Love the chintz upholstery. I have to say, I really did love the decor. 😀 “Old-world-charming” is a great way to put it!